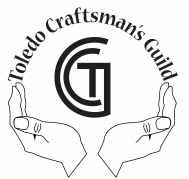 The Toledo Craftsman's Guild publishes The Journal twice a year (early spring and early fall). The Journal advertises our Members’ small businesses, our craft and art shows, various articles of interest, and advertisements from local businesses, regional art and craft shows, and much more. Pick up a copy of The Journal the next time you are at one of our shows, or download and view it now. We encourage Members, non-Members, and businesses to place an advertisement in our paper. Your small advertising investment will reach approximately 5,000 people who attend art and craft shows, shop at art and craft establishments, and visit local offices, businesses, and hospitals. Simply complete the form below and mail it with your payment. If you don't have an advertisement, we'll help you create one! Just ask! Copies of The Journal will be hand delivered to your establishment by one of our committee members.